Tenacious and determined, Jenna Keaton has no plans for a husband or marriage, devoting her time and energy into her career. Josh Carver is successful, handsome, charming and blissfully single. When the two of them meet, sparks fly. 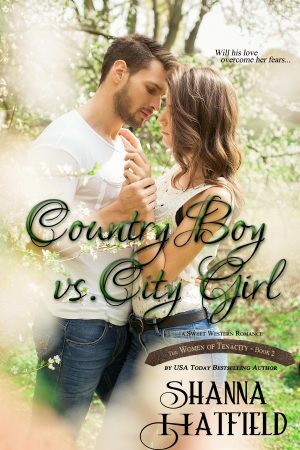 Love gets entangled in the war of country boy versus the city girl. Josh was watering Jenna’s flowers when he heard a scream from inside the house. Tossing aside the hose, he entered through the back door at a run. As he plowed into the kitchen, he saw Jake’s red face turned toward the wall while Jenna, her face even redder, clutched a dishtowel to her chest as she slowly backed out of the kitchen. Her outfit, at least what he could see around the dishtowel, made his eyes widen in surprise. Glad he wore a shirt that snapped up the front, Josh quickly yanked it loose, slipped it around Jenna, and swept her into his arms. There was no way she could beat a hasty retreat in the strappy high-heeled shoes she wore. He carried her into their bedroom, kicked the door shut, and dropped her on the bed. Standing up, he gaped at her.